An exciting season of NASCAR racing concluded at Homestead-Miami Speedway yesterday after Kevin Harvick drove his No. 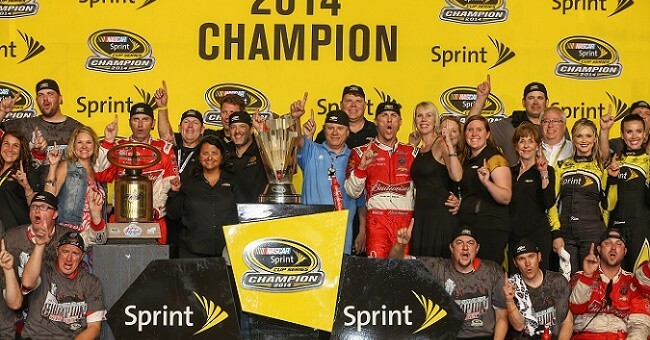 4 Chevrolet SS to a win, clinching the 2014 Sprint Cup championship. Harvick’s win also contributed to Chevrolet’s Sprint Cup Series Manufacturers’ Championship, which marked the 12th consecutive year and 38th time overall the bowtie has won the title. Harvick and the three other remaining drivers in the Chase, Ryan Newman, Denny Hamlin and Joey Logano fought tooth and nail for top position throughout the caution-packed race. Newman led the most laps among his Chase competitors, however Jeff Gordon led the most laps of all at 161 of 267. The true battle was between Harvick and Logano, though, who have outperformed much of the NASCAR field all season. NASCAR’s new Chase format, which started with 16 drivers and knocked them out of contention over the course of 10 races, was enacted with the sole intent of creating a “Game 7” type final race. The format was successful in stirring up drama, with drivers literally fighting over a spot in the Chase, and ultimately crowned the most skilled driver the winner. Harvick has led more laps than anyone this season and has racked up 5 wins, just one behind leader Brad Keselowski’s six. A late caution flag with under 20 laps left in the race likely stirred up the finishing order a bit and worked to Harvick’s advantage. Logano, Harvick’s closest competitor in the race, had his car fall off the jack during a pit stop, sending him back to 29th place. Another caution flag prompted a restart with four laps remaining, with three Chase drivers, Harvick, Newman and Hamlin, sitting 1-2-3 on the grid. Upon the restart, Hamlin, who opted to stay out on old tires during the caution periods, had trouble keeping pace with Newman and Harvick. An ever-concentrated Newman couldn’t quite catch a faster Harvick in the closing turns and handed the 38-year old his first ever Sprint Cup Championship. I could not find Waldo. However I do see 1 woman using her middle finger. Flawless victory General! See you in victory lane in 2015!